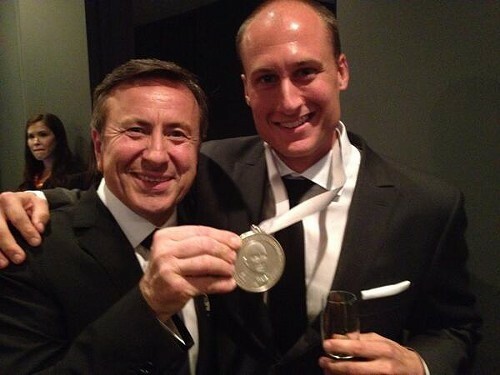 Daniel Boulud congratulates Beard Award winner Dave Beran. The James Beard Foundation Awards had a year of women last night, with prizes going to celebrated woman chefs such as April Bloomfield (New York's the Spotted Pig and the Breslin), Nancy Silverton (Pizzeria Mozza and a long history as a leading figure in bread baking), and Barbara Lynch (half a dozen restaurants in Boston)—but the Chicago portion of the awards didn't have anything to do with that. Dave Beran, chef de cuisine at Next, finally nabbed Best Chef, Great Lakes in his third nomination in three years (for the same award last year and for Rising Star Chef the year before). Rising Star Chef resulted in a tie, half of which went to Jimmy Bannos Jr. of the Purple Pig, even though he's actually been a chef there longer than Beran has been at Next (but the Beard Awards run on their own time scale that way). Paul Kahan was named to the Who's Who of Food & Beverage in America, but One Off Hospitality didn't win any of the other awards it was nominated for this year (to Blackbird chef David Posey and pastry chef Dana Cree, Donnie Madia for outstanding restaurateur, and the Violet Hour for Outstanding Bar Program). Lawton Stanley Architects won the restaurant design award in the 75 seats and under category for Grace (an award that was apparently tweeted by accident on Friday, but officially announced last night). At the media awards on Friday, a pair of Chicago-based authors won for books—French Pastry School head Jacquy Pfeiffer for The Art of French Pastry and Amy Thielen for The New Midwestern Table, while This American Life won the radio category. The win for Beran comes with a little bit of the feeling of punctuation ending a chapter. Next was a phenomenon at least as much as a restaurant from its opening in 2011, with its genre-bending approach to menus (themed and set for months at a time) and reservations (by ticket, which included prepayment via its proprietary online ticketing system). Not that long ago Next fans watched the Internet for any clue about what a menu might contain—when Beran tweeted a fuzzy view of a scribbled Next Childhood dish list, people traded ideas on what the scribbles might portend and cracked the full menu within hours. And the actual release of tickets produced flurries of speed-clicking and bitter recrimination on Twitter by those who failed to log in fast enough during that few-minutes window, or who had their credit cards declined. Next-mania lasted a good two years or more, a remarkable run, but it's been easier to get tickets for a while. Two weeks' worth of tickets for the new menu, Next Chinese: Modern, went up yesterday morning and tickets were still available last night (though being only 90 percent sold out is, of course, a position most restaurateurs would love to be in). Just as Next-mania fed itself—the desire to get tickets fed a desire to see previews of the menus in the media and a desire to be the first to tweet or post images of the dishes on social media—so the cooling of Next ardor has made each subsequent menu less visible, less of a presold commodity, which means fewer people are amped up to buy tickets as soon as they can and start the whole cycle over again. It doesn't help either that many of the media that lived off Next in its early years have subsequently disappeared or are at least significantly diminished. Just the last couple of weeks brought changes to two more Chicago outposts of New York-based sites, Tasting Table and Serious Eats, which look to be cutting back on Chicago-specific content (disclosure: I have written for both). We're not seeing as much of Next because we're not seeing as much of a lot of things in a lot of places anymore. Next: Modern Chinese from next restaurant on Vimeo.